'Their energy and enthusiasm need to be tapped in order to meet their aspirations and transform agriculture and the rural economy,' says P K Joshi. 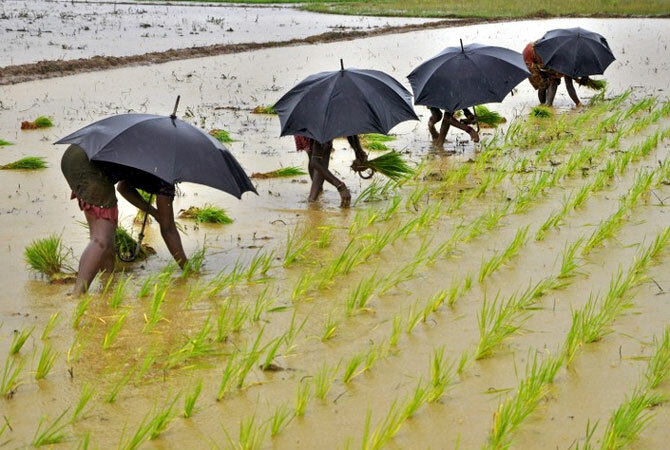 Indian agriculture is confronted with high price volatility, climate risks and indebtedness. Since the majority of farmers (86 per cent) are small and marginal with declining and fragmenting landholdings, they are more vulnerable to uncertainty. The last three Budgets have been pro-agriculture. More resources were allocated to agriculture and a number of programmes have been initiated to increase irrigated area, improve soil health, promote agro-processing and cover production risk, among other things. It seems that all these programmes and schemes function independently of each other. Therefore, it is time to have a five-point programme that addresses agrarian challenges and combines various on-going programmes under one umbrella. Agricultural transformation has been very slow in India. Therefore, the process of generating higher income from agriculture has also been slow. An increase in production was the main objective, rather than raising incomes. The government has adopted the target of doubling farmers' incomes by 2020. This will require 1. An aggressive push to improve technologies by strengthening the seed sector and the knowledge dissemination system; 2. Agricultural diversification in favour of high-value commodities and the development of value chains by linking production and marketing centres; and 3. Development of mechanisms to ensure minimum support prices in the event of a crash in farm harvest prices. The chances of success will depend on how farmers are aggregated for production and marketing through promotion of contract farming, cluster farming, farmer producer organisations and self-help groups. The Situation Assessment of India reported that more than 40 per cent of farmers would like to exit agriculture if alternative opportunities are available. Agriculture is becoming crowded and does not provide regular employment opportunities. In the absence of regular employment in rural areas, the rural population, especially the youth, is migrating to urban areas to explore better avenues. By 2020 around 34 per cent of India's population will be in the 15 to 34 age group. More than 70 per cent of them live in rural areas. Their energy and enthusiasm need to be tapped in order to meet their aspirations and transform agriculture and the rural economy. Agriculture per se will not be able to absorb the growing number of youth in rural areas. Incentives need to be given for 1. Aggregating raw and processed products (a good example is Lijjat Papad, which employs more than 43,000 women); 2. Promoting self-employment in agro-processing, agro-advisory, agriculture and rural transport; 3. Private sector engagement in custom-hire services, secondary and tertiary processing, 4. Location-specific non-farm employment in micro, small and medium enterprises and linking them with the large manufacturing sector, and 5. Engagement in government programmes, schools and agriculture extension. Risk in agriculture has been increasing over the years. Both production and price risks are leading to agrarian distress. As far as production risks go, the incidence of drought, floods, rising or falling temperature and unseasonal rains and hailstorms is increasing and hurting agricultural production. However, during normal years, farm harvest prices fall steeply, affecting farmers' incomes. The Prime Minister's Agriculture Insurance Scheme is already in place to cover some production losses. Though the scheme is good, the compensation is not enough and does not cover the risk of falling prices. Therefore, the government must consider launching a Prime Minister's Climate Resilience Scheme that covers both production and price risks. The scheme could club promotion of climate smart agriculture, provision of value-added weather advisory services and effective implementation of agricultural insurance, and ensure minimum support prices. Agri-infrastructure -- including agricultural markets, cold storage, warehouses and agro-processing -- has not developed commensurate with increasing agricultural production. The pace of agri-infrastructure creation is far slower than what is needed to improve the overall agri-food system. Greater focus was given in the past to the production of agricultural commodities. In the absence of adequate agri-infrastructure, the supply chains of agri-food commodities are in the hands of the unorganised sector, which is fragmented and inefficient. The organised private sector is coming up slowly, because developing agri-infrastructure is not very commercially viable. There is immense scope for high economic and social gains through public-private partnerships in developing agri-infrastructure. The government should constitute a commission to develop the modalities of public-private partnerships in building agri-infrastructure such as rural agri-markets, cold storage, agro-processing, surface irrigation and agricultural extension. Lessons can be learnt from the excellent track record of PPPs in the construction of national highways, building and functioning of airports and distribution of power. The central government can aid the states in viable projects in PPP mode to develop agri-infrastructure. Rural India still lacks basic amenities such as sanitation, hygiene, drinking water, drainage, schooling and health care. Three years ago, the prime minister had urged every member of Parliament and the state assemblies to adopt one village and transform it into a model village. The main objective was to provide all basic facilities in rural areas, to improve the rural population's quality of life. Former President A P J Abdul Kalam had coined the acronym PURA (Provision of Urban Amenities to Rural Areas), with the aim of providing urban infrastructure and services in rural hubs in a bid to create economic opportunities in rural areas. The scheme can be revived to improve the quality of life in rural areas. Though there are several schemes to create social and economic infrastructure, these need to be combined for greater impact. It is time to revive the agriculture sector and improve the purchasing power of the bottom of the pyramid to accelerate overall economic growth. It can only be done by focussing on key areas and implementing the programme under one umbrella. P K Joshi is Director-South Asia, International Food Policy Research Institute, New Delhi.